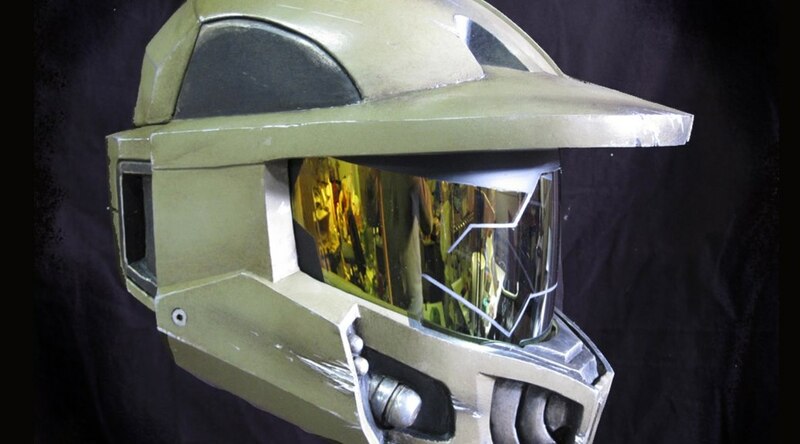 Jonathan Neill made this time-lapse video where he sculpts a cosplay helmet in just over two minutes. Watch as he takes a lump of water-based clay and transforms it into a piece that resembles machined metal. We opened Pump Boys and Dinettes here at Triad Stage a few weeks ago. Set in a diner famed for its home cookin’, we needed some pies. They sing about them, after all. Of course, we didn’t want to be buying brand new pies for every performance, so I asked my assistant, Lisa Bledsoe, to make a few. 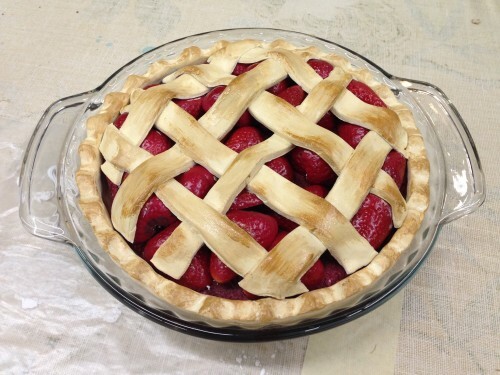 She started off making the pie crusts out of Crayola Model Magic. 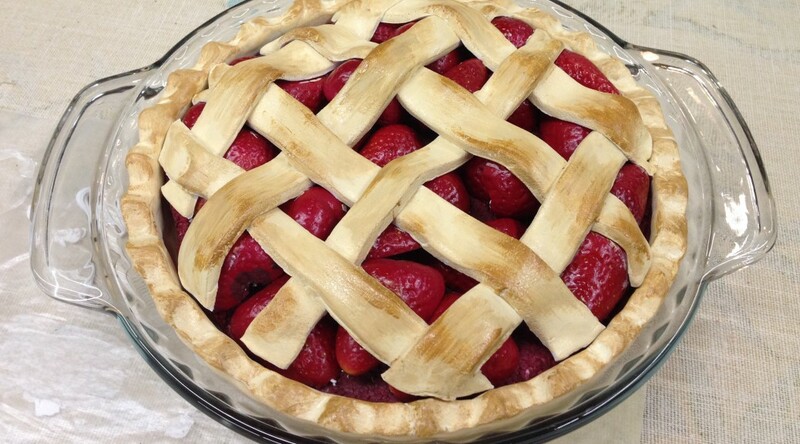 She shaped a layer into a glass pie tray and let it harden over night. She cut some white bead foam discs to fill most of the inside. She was making two pies; a fruit pie and a coconut cream pie. 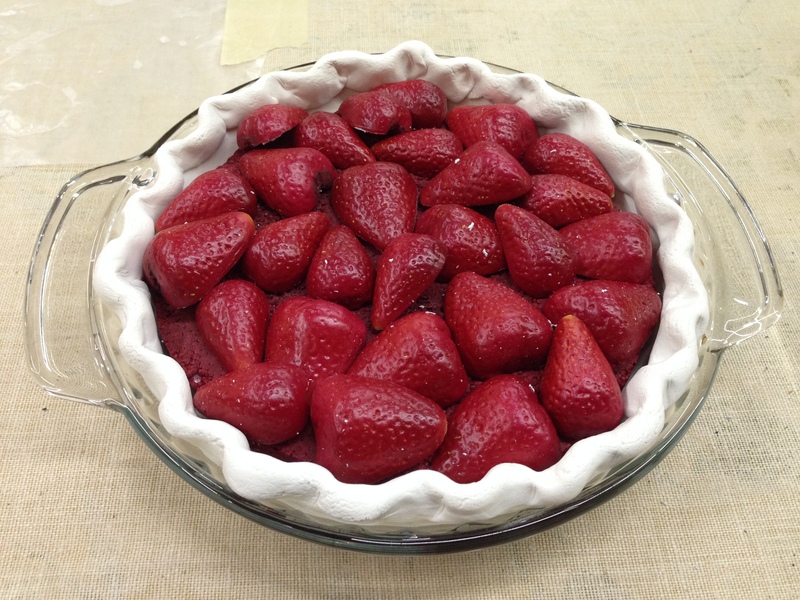 For the fruit pie, she had some fake strawberries from the floral section at Hobby Lobby, and cut all of them in half to make a layer on top of the foam disc. She painted the disc red to continue the illusion that it was strawberries all the way down. 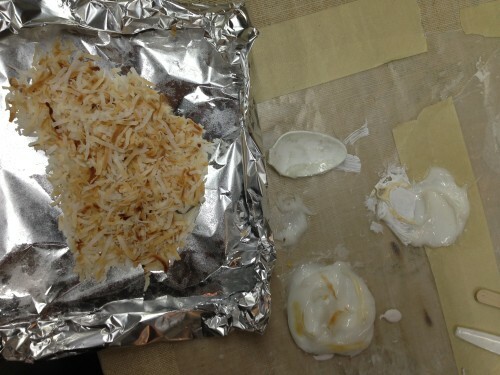 To top the coconut pie, she used actual dried coconut flakes. They were painted with acrylics to make them look toasted. 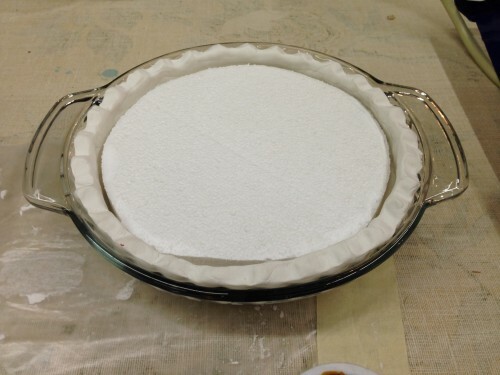 The Model Magic did not stick to the pie tray, so she was able to pop the whole pie out and paint the crust with acrylics before popping it back in. 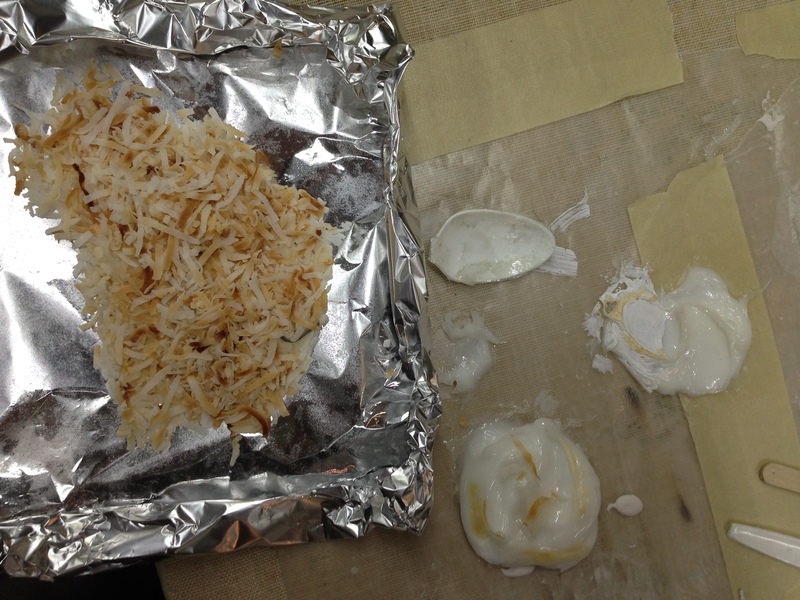 The cream on top was made from acrylic caulk. She had visited the hardware store and picked up a few different brands and types of caulk and spackle to test out which would dry the most like a cream pie. The strawberry pie got a lattice crust made of more Model Magic painted with acrylics. 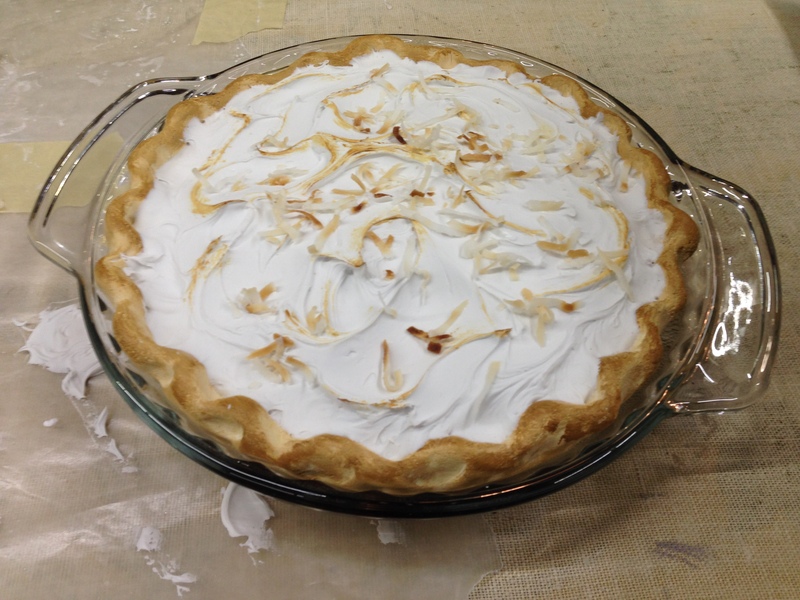 So there you have it; the Double Cupp Sisters’ famous pies! The American Museum of Natural History has an amazing historical photo archive, many of which show the setup and construction of their dioramas and exhibits. Museum props is props too! Here is the curious evolution of the typewriter, with pictures. I’ve certainly had to provide my fair share of vintage typewriters for shows, but I’ve never had to track down one of those writing ball machines. Haley Polak, a props artisan, had to build a mastodon skeleton. She used urethane foam and FoamCoat to pull it off. Finally, here is a very cool photo set of an android being built. It has lots of great process shots of sculpting, molding and casting. Just a reminder that there’s little more than 25 days left to enter the Prop Building Guidebook Contest! You can’t win if you don’t enter. 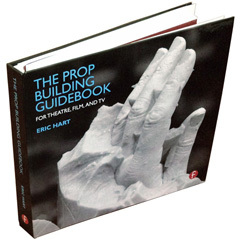 I also wanted to ask a favor; if you have already bought your copy of the Prop Building Guidebook, head on over to the Amazon page (or to whichever store you bought it from) and leave a rating or a comment. I also have a Facebook page where you can tell me what you think. I’d love to hear what you like about the book, what you don’t, and how you’re using it. Now, onto the links! David Katz has a website with a lot of information centered around his “Chemistry in a Toy Store“. It has some pretty fascinating articles about how common chemical toys work, such as Silly Putty, Slime, Shrinky Dinks, and the like. What is even more useful is if you scroll down, you will see Chemistry in the Toy Store Recipes; Katz shows how you can use common household ingredients to make things like slime, ooze, disappearing ink, various putties and more. Props people need these recipes all the time, and Katz is the chemist who originally came up with most of them. Phil Obermarck is a sculptor who runs a blog, and he has an in-depth article about his experience using Jesmonite. Jesmonite is a gypsum-based acrylic resin that can be used with fiberglass. Unlike typical fiberglass resin (usually a polyester resin), Jesmonite is water-based and contains no solvents, which gets rid of a LOT of the health and safety hazards inherent in using fiberglass (though certainly not all of them). It unfortunately looks as though it is only available in the UK and Europe, though you can get comparable products in the US (Aqua-Resin being among the more popular). Photographer Andrew Scrivani has an interesting article in the New York Times on how to choose props to improve food photography. While few of us may be propping a food photo, the ideas he shares are just as useful for anyone dressing a set or designing the props in a scene. The original Frankenstein movie was a hallmark in special effects makeup as well as set dressing (try to think of a science laboratory that hasn’t been influenced by this film). So how cool is it to see behind-the-scenes photographs of Frankenstein and similar monster films? We just closed and struck Cloud 9 here at Elon University. I was the prop master on the show and built a lot of the pieces. One of the fun (and funny) props I constructed was a grand Victorian-era wedding cake. It was meant to be a bit over-the-top, with a grand appearance at the end of Act One when the hastily-arranged wedding occurs. 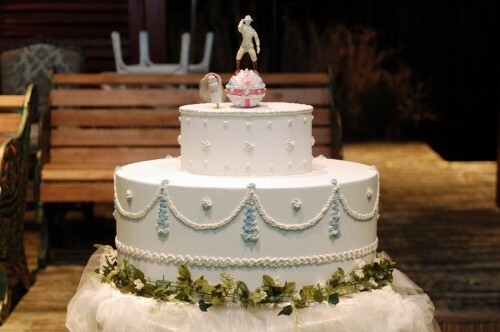 Part of the visual humor came from the cake toppers; the scenic designer (Natalie Taylor Hart) wanted the groom to be a detailed representation of a man striding atop of a Royal Orb, while the bride would be a much smaller and crudely-made figurine stuck in the cake as an afterthought (the play, for those unfamiliar, deals with gender politics in various degrees). To make a sculpted figurine of the groom, I started off with bending a wire armature into the pose I wanted. This also let me establish the proportions of the limbs. It wasn’t anything fancy; I cut up a wire hanger and held it in place with plumber’s putty. Plumber’s putty is a type of epoxy putty which is soft and shape-able when you first mix it together, and becomes rock hard after a few minutes. I liked it on this project because I could build up the sculpture bit by bit, allowing the parts to become hard as I worked on other things. I could return to the sculpture later and add more bits without worrying about smooshing the parts I already made. It also did not need to be fired or coated to finish it. The putty I used was left over from another show, so I did not have to spend any more money on a show with a tight budget. In the last frame of the picture above, you can see I added some clothes. The putty is not very good for getting fine details; you can machine and carve it after it has hardened, but I wanted a quicker way to get some semi-realistic clothing texture on top. I took muslin and soaked it in glue and water, than manipulated it over top until it “draped” like a shirt and pants. After the glue dried, it retained its shape. The rest of the cake was pretty straightforward. The bottom base is a strip of wiggle wood wrapped around plywood formers, while the top is a solid chunk of white bead foam coated in joint compound. I used painter’s caulk for the icing details. Normally you want to use acrylic caulk rather than silicone caulk, because silicone caulk does not take paint. However, I found some newer stuff which is a mix of acrylic and silicone; the acrylic makes it paint-able, while the silicone keeps it a bit flexible and lets it dry a lot faster. I bought a few decorative cake icing tips, and just attached them to the end of the caulk tube so it would come out all fancy.